If you are a restaurant owner or manager you are aware that one of your responsibilities is to make sure things run smoothly both in the kitchen and the dining area. The kitchen should be a place where everything is clean, neat, tidy and organised for the very simple reason – food is prepared here. So, in order to keep the kitchen spotless, you need a commercial dishwasher which will clean more efficiently, in a faster way and with less effort than using a sink. The commercial dishwasher offers numerous advantages such as lower labour costs, increased efficiency, cost and power efficiency and durability. When it comes to choosing the perfect dishwasher for your kitchen needs, here is what you need to take into consideration. To begin with, the size of the dishwasher is of huge importance as the dishwasher needs to be big enough to cater to your kitchen’s needs. Because it is the world of commercial dishwashers, “racks” is the suitable unit of measurement when we talk about size. So, how many racks you need your dishwasher to have depends on how many glasses, mugs, soup cups, bowls, plates and kitchen utensils are being used in the course of the day. In fact, in order to estimate how many kitchenware needs to be washed, the “peak hour” or the busiest hour of the restaurant will set the pace. With this in mind, a restaurant typically produces 35 racks of dishes per 100 meals, so you can use this as a guide to estimate your needs. 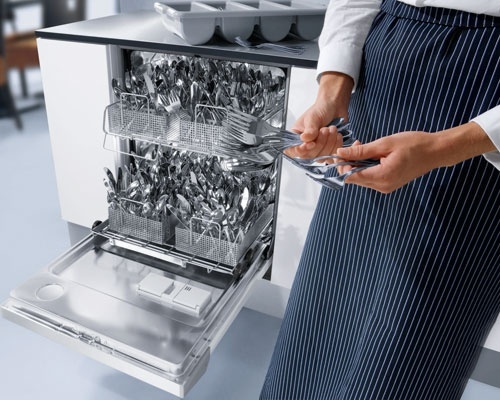 There are several types of kitchen dishwashers. If you have a bar within the restaurant, then it is probably a good idea to make a combination of two smaller dishwashers rather than buying one single but a large unit. Among the most popular types is the commercial under bench dishwater which is a model very similar to the ones for residential use. It can hold a single rack with a removable cutlery basket and plate holder. The good thing about the commercial under bench dishwasher is that a good model can have the potential of up to 1100 cups or glasses per hour. They can be a great supplemental appliance that will assist a larger model and it is best to instal them between the bar and the kitchen to save the bartenders from running back and forth to the kitchen. Another type is the door type which is a dish pit that consists of several stations including a station to throw away remaining leftover food, a station to rinse off the remaining crumbs, a station with a washer and a station where the dishes dry and then put away. They are perfect for small-scale restaurants as they can wash up to 80 racks per hour. The conveyor is suitable for larger restaurants or for restaurants with high turn-over rates. You can find them in different sizes, speeds and prices and depending on these features, they can wash from 200 racks to 400 racks per hour. There is also the flight commercial dishwasher which is larger than the conveyor and it is used in hospitals, cafeterias and banquet halls where there are hundreds of people eating and drinking. The dirty washes and glasses are loaded on the conveyor belt which takes them to be pre-washed, washed and dried. The flight washers can wash up to 8000 per hour. Finally, there is a glasswasher, and as the name suggests, it is used only for dirty glasses. They are small but can wash up to 2000 glasses per hour, excluding china or silver. If you don’t use porcelain or silverware in your bar, then this model is the best one to keep your glasses and mugs constantly clean.